I’ve been caught up in a whirlwind of chores, home repairs and working out that blogging has taken a back seat (unfortunately). But the good news is that my energy level is up. I don’t know if it’s due to changes in my supplements, the mindfulness is kicking in, my increased workout schedule or a combo of the three. Just a couple of big projects to wrap up and then regularly scheduled blogging and cooking videos can commence. Whew! Anyway, here is a great way to start your day: Grilled Thai Steak Salad. Yep, that’s right. A salad for breakfast. For St. Patrick’s Day I ended up making a corned beef brisket but forgot to buy the cabbage. Thankfully I had some Brussels sprouts in my fridge. They are the same species as cabbage and green too! Whew! I was planning to add bacon to the sprouts when I came across this recipe in The Real Meal Revolution. For some reason I never thought to lightly saute steamed Brussels sprouts in the rendered bacon fat. Add in creme fraiche and awesomeness happens. What initially started off as a boring steak and zucchini dish turned into an awesome salad thanks to some heirloom tomatoes and chimichurri sauce. When putting together my weekly menu, I originally planned a Wednesday lunch of grilled rib-eye steak with 1/2 a large zuchinni. Wow, there’s excitement for you. Then it dawned on me to make zoodles with the squash and add some Argentine chimichurri sauce. That sounded tastier. Toss in some slices of heirloom tomatoes and now you’ve got an awesome salad. Chimichurri sauce, if you haven’t experienced it, is just wonderful. Garlicky and tart, the bright green color really pops. It can double as a marinade or sauce that you can use for chicken, pork or vegetables. But I absolutely love it with steak. Nothing like a keto friendly meal to break a fast. Egg salad, butterhead leaves and glorious bacon. Yum. Last night I whipped up the Aktins’ egg salad recipe. It was the perfect way to break my fast this morning (30 minutes after a few olives). Now I’ve never been a fan of egg salad. Growing up most of the time my dad just got some from the store. It always smelled overwhelmingly eggy to me. But then again as a kid I was a very picky eater. Thankfully I’m done with being “too picky.” Although I think my hubby might not quite agree with me on this point. Anyway, the recipe is very simple and delicious. My favorite part is the celery. That might seem strange as I unconditionally love eggs. But the celery adds a great crunch and texture. I added 3 large Boston butterhead leaves and thick bacon for a grand total of 3g carbohydrates. Perhaps my lunches are too boring for the hubby’s taste buds. They certainly are losing out to the junk sitting out across from his lair cube. Reality hit me the other day when he blogged about a nightmare he had the other night. A dream so hideous that it shook him to his very core — he was at a buffet and they never filled the French toast bin. Oh, the horror! I think it’s time to rethink my lunches. 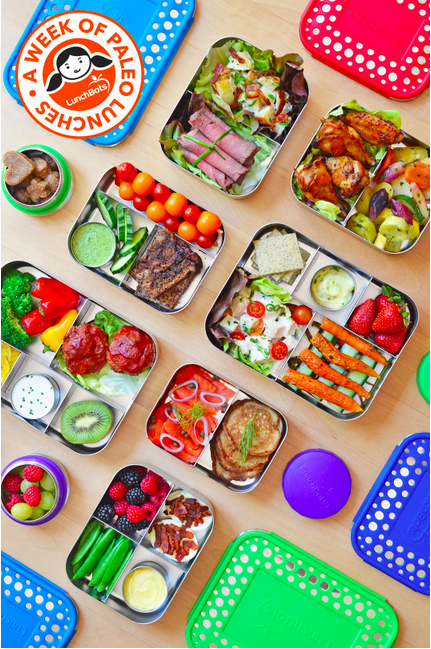 Thankfully Michelle Tam of Nom Nom Paleo packed a ton of great lunch ideas in one location on her awesome blog. For both kids and adults, her food combos can more than compete with any of that processed crap. Besides her 20+ ideas, Michelle includes a mess of lunch related links to give you even more ideas. We’re headed to Florida this week. While the hubby is attending a writer’s conference I’ll slave away on a game plan for next week’s lunches…all done poolside of course! Just combine all of your ingredients in a food processor. You’ll have a great tasting salad dressing in minutes. Avocado and basil…two wonderful flavors joined to make a healthy, tasty and creamy salad dressing. I found it recipe on the Nom Nom Paleo app — a must for every healthy kitchen. An app review is coming soon (hint: it is awesome!). The dressing reminded me of a creamier version of my pesto, with the avocado flavor taking the place of my beloved walnuts. It’s a pretty thick dressing thanks to the avocado. If you want it a little thinner, I suggest adding a more lime juice. But not too much more…you really want to keep the great avocado-basil flavors. You can also just use a couple of tablespoons of water. If you rather not thin it, I’d suggest tossing the dressing and salad in a bowl before serving. For dinner we had Chorizo-Stuffed Portobello Mushrooms (that recipe will be up tomorrow). I just added a side of mixed greens with tomato and a tablespoon (half the serving size) of the dressing on top. Yum! Remove the skin and pit from the avocado and place in a food processor. Add in the basil leaves, garlic, lime juice, salt, red and black peppers, and olive oil. If too thick, try adding water or juice from 1/2 lime. I’m trying to come up with low carb breakfast ideas that don’t include eggs. Don’t get me wrong I love eggs. It’s just they’re on the menu nearly every morning. It seems like the main ingredient for the most important meal of the day include eggs — Omelets, quiches, fritters. I am eggless on my weight training days. I need to carb up for those workouts so a bowl of Kashi GoLean works. If not Kashi then I’m eating steel-cut oatmeal or Greek yogurt with fruit. Yummy and a nice break. But for non-weight training days I need something low carb, high protein. So no grains. I think I need to break free of the breakfast mindset. Who says you can’t eat a 3-bean chili in the morning? Or a grilled chicken salad? I checked out a couple of paleo sites, but nearly all recipes called for eggs. However some ideas intrigued me, like soup or making a BLT sandwiched between slices of bell pepper instead of bread. I did find a recipe for grain salad with blueberries and hazelnuts, thinking it would add more variety when I do my muscle workouts. But when I ran the numbers the net carb count, 46g, was too high. Heck, that’s nearly half my carbs on my weight training days. I’m still adding the recipe in my database. It looks tasty. How do you break free from eggs in the morning? Sometimes I get the hankering for egg salad. Don’t know why, but I do. Here’s an Atkins’ recipe that combines two of my husband’s loves – eggs salad and curry. It’s pretty easy to make and filling. I like serving it over a bed of mixed greens or baby spinach. I’m sure it’s good on bread too for you grain eaters. Peel and halve the eggs. Separate the egg yolks from the whites. Using a fork, mash the yolks. Finley chop the whites. Combine egg yolks, mayo, onion, parsley, curry powder, Worcestershire sauce, salt and pepper in a medium bowl. Gently fold in the egg whites. Serve right away over 2 C mixed greens refrigerate in an airtight container for up to 4 days. Suggestion – Try adding a few slices of avocado to the salad. Yum! Pesto is just yummy. Pesto-Chicken Salad is even yummier! Image courtesy of zole4 and FreeDigitalPhotos.net. I love this recipe. However, with fall weather loudly knocking at my door, I’m making this tonight, but trying a hot version. Oh yeah, baby. Combine celery, mayo, onion, parsley, pesto, salt and pepper in a bowl. If using freshly cooked chicken, chop chicken while it is still warm and toss into bowl and mix. Otherwise, warm chicken to desired temperature in a microwave on medium heat for 1-2 minutes; transfer to bowl and mix. Serve immediately on top of baby spinach. Eat up. Combine basil, pine nuts, cheese, garlic and zest in a food processor; and slowly add in the olive oil during blending. Blend until desired texture. Taste and add salt and pepper as necessary. Store covered in the refrigerator for up to one week. To freeze, it’s best to divide it into smaller portions so you don’t have to defrost the entire batch. Hint: You can freeze in ice cube trays and then store the “cubes” in freezer bags.